I want to thank our hosts, the Chifley Research Centre and KPMG for this morning’s function. That’s why my united team and I are focused on ending unsustainable tax subsidies that disproportionately favour a fortunate few – because they’re unfair and unaffordable in the long run. Simply put: tipping billions into exemptions and deductions for the lucky few is the same as ripping billions out of our schools and our hospitals. Because every dollar that slips through a tax loophole is a dollar that cannot be invested in the Australian people and their potential. Every dollar allocated to tidy little arrangements for people who already have millions of dollars, is a dollar that can’t be used to repair the budget, is a dollar that cannot be used to bring Australia back to surplus and to build a better future for our children. And every dollar our opponents spend on preserving exemptions for the top end of town is a dollar they cut from Medicare or education, or extract from middle Australia in higher taxes, or indeed, they’ll just force taxpayers to pay more interest on the nation’s debt. Taken together, this is the biggest set of reforms since Hawke and Keating. Serious reforms, courageous policies, focused on the decade ahead. 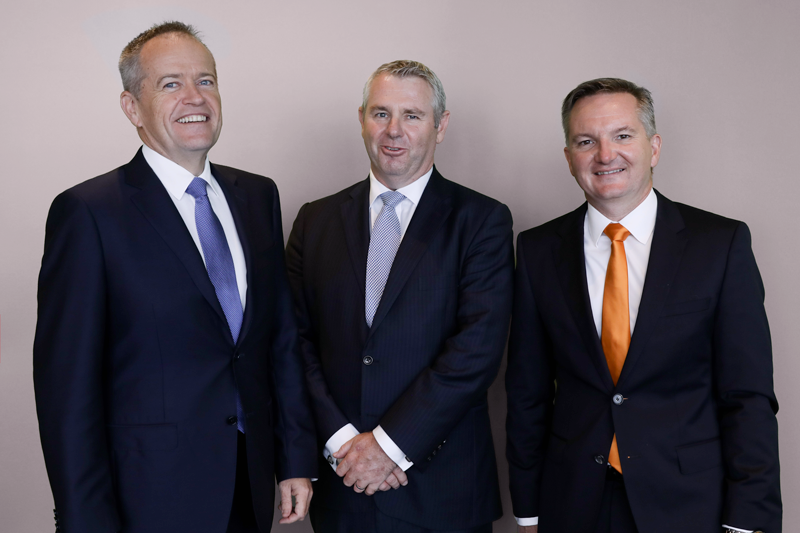 It’s a great credit to my Shadow Treasurer, Chris Bowen, to our Shadow Finance Minister, Jim Chalmers and our Shadow Assistant Treasurer Andrew Leigh. I count myself very fortunate to be leading a great team, who drive good policy. And we are making room to provide tax relief for low and middle income earners. Of course, our opponents label each of these measures the ‘politics of envy’. They’re wrong. This is about a fair go for All Australians. As Prime Minister, I will not take money out of the pockets of working families and hand it to millionaires and multinationals in tax deductions and subsidies. For example, we’ll exempt farmers from our changes to discretionary trusts, because we recognise the unpredictability of income in a seasonal industry. And we’ll retain negative gearing for investors in new property, to create construction jobs. If you’ve accumulated $4 million in superannuation, congratulations. I just don’t believe you need help from other taxpayers to turn that into $8 million. If you already own three investment properties, I don’t think the taxes of young people locked out of the housing market should be subsidising the purchase of your fourth investment property. I’m proud my team and I have chosen a different direction, guided by our Labor values. And I’m proud that we’ve also taken the Australian people into our confidence – not trying to slide past scrutiny, not hiding things in the small print in the dying hours of an election campaign. When Bob Hawke and Paul Keating introduced Australia’s system of dividend imputation, Keating’s specific goal was to eliminate double taxation on company profits. The practical effect is that when a company makes a profit, it pays company tax – and if the company elects to distribute some its profit to shareholders as a dividend, they getwhat’s called an imputation credit. Take the example of a couple with $1.6 million in their self-managed super fund. And say $1 million of this fund is in Australian equities. These dividend recipients will pay an imputation credit of $20,000 – that’s equivalent to the amount of tax the company has already paid on this income. But because this couple have no tax liabilities of their own, they can claim a refund for the entire value of that credit – that’s $20,000 in cash from the tax office. refundable dividend imputation credit system. Now when this change was introduced by Mr Howard and Mr Costello, the budget surplus was nearly 1 per cent of GDP and the estimated cost of the measure was $550 million a year. But after four Liberal budget deficits, the deficit is above $23.6 billion. Over the medium term, if nothing is done to address this largesse, the subsidy alone will cost the budget $8 billion every single year. Federal Police. And with our ageing population, this subsidy represents a ticking time bomb that must be defused. Universal superannuation is one of Labor’s greatest reforms- and we will always defend the integrity and the universality of Australia’s national savings system. It is why a Labor Government will restore the imputation system back to its original design. Let me be very clear about this, Labor created dividend imputation, Labor understands its value and we will maintain it. Firstly, this change will only affect a small fraction of shareholders who currently have no tax liability and use their imputation credits to receive a cash refund. These people will no longer receive a cash bonus – but they will not be paying any additional tax. Let me repeat this: a small percentage of people will no longer receive a cash bonus – but they will not be paying any additional tax. This reform helps guarantee that we can fund essential investments in schools and hospitals and also return the budget to a strong surplus. Our savings are built on structural improvements, not one-off cuts to pensions and services and family support, so we can deliver stronger and bigger budget surpluses each and every year. At the National Press Club in January, I set the ground rules for my team this year. I said that Labor would be prepared to take on the big generational issues, even if they were politically difficult. This policy is proof of what I said at the end of January. Today’s actions are genuine and serious reform. Reform that will enable us to provide real tax relief for working Australians. It shows my team and I are fair dinkum about tackling inequality and serious about ending unsustainable subsidies and concessions for the already well-off. And before my opponents run around saying this is about putting up taxes for ordinary people, that dividend imputation is a Robin Hood concession which is benefiting the poor rather than the very well-off, or before they try the cynical trick of calculating some kind of ‘average’ figure on every citizen of a state, as if babies in prams in Western Sydney are being denied their right god-given right to an investment property in Woollahra. If you earn less than $180,000 – you won’t pay any more tax under Labor either. It’s true if you’re accessing tens of thousands of dollars in subsidies to minimise your tax bill, you will pay a bit more – you will pay your fair share. If you’re a multinational company shifting your profits overseas to avoid tax here, then yes you’ll pay more – too right you will, you should pay your fair share. years’ time. It’s not just wage earners who miss out, what it also means under dividend imputation is that mum and dad investors won’t gain from this policy either. Because the Liberals’ corporate tax giveaway is so dramatically skewed towards big business, 60 cents in every dollar of the Coalition’s tax giveaway ends up overseas. Let’s be clear: the Coalition’s corporate tax reduction is not a plan for Australian investment or Australian jobs or Australian wages – it’s corporate welfare for multinational firms, it’s foreign aid, for foreign companies. The Liberals’ company tax cuts would deliver a windfall gain for money already spent and decisions already made. Labor’s Australian Investment Guarantee will encourage and reward businesses undertaking new investment, new upgrades and new innovation, new productivity. This is a sustainable investment for substantial growth. Not a one-off, not just a sugar hit – a permanent change in our system driving a permanent lift in business expansion, in business modernisation and in business job-creation. That’s the difference – the Government’s growth plan is corporate tax giveaway with the principle benefit is felt by foreign shareholders overseas. Labor’s investment guarantee rewards companies for actually investing in Australian technology, Australian production, in our innovation, in our productivity. The beauty of our proposal is that we can guarantee jobs and investment because you don’t get the depreciation benefit without it. The problem with their giveaway is it just supports multinationals and overseas shareholders. In education and training, we’ll boost the skills and knowledge of our future workforce. In child care, we’ll make sure that Australian women have equal opportunity to work for equal pay and our children are nurtured. In Medicare, we’ll make sure that our population healthy and strong. And our Australian Investment Guarantee will mean more businesses – small, medium and large – are expanding and creating good jobs, boosting productivity. If we win this election, I want the Australian people to know we are serious reformers. But more than that, I want Australians to see the benefits of our reforms – and fast. Where regardless of your postcode, whether you’re in our great cities or in our regions–no-one is second class.